In the United States, acne affects up to 50 million people making it the most common skin conditions. 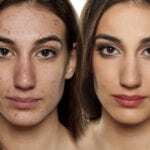 Teens to older adults find themselves battling blemishes and seeking treatments that will not only clear up their skin but make it healthier. One way to help this issue is by balancing the microbiota on the skin. Learning about what this is, how it can help and how to balance it is the first step. This condition affects the hair follicles and oil glands of the skin. The pores on your face connect to the oil glands which produce sebum, a type of oily substance. The follicle is a type of canal that connects the glands and pores. Oil takes dead skin cells via the follicles to the skin’s surface. Sometimes, sebum, skin cells and the hair in the follicle clump together and form a plug. Swelling can result when bacteria get into the plug. The bacteria is known as Propionibacterium acnes. It lives on the skin. Once the plug starts breaking down, a pimple results. Pimples most often occur on the face, back, shoulders, neck and back. Experts state that the strain of bacteria influences the frequency and severity of breakouts. It is important to note that not all bacteria cause pimples to occur. There are bacteria that may actually improve the health of your skin. When you look at all of the bacteria in and on the body, it makes up approximately three percent of your body weight. Some of these are considered friendly bacteria, meaning that they do not cause harm and may actually benefit the health of your skin and body. There are more than 500 species of bacteria on the skin that make up the skin’s microbiome. This is essentially a system that protects your skin from outside assaults and it also plays a role in immunity. Whether you experience breakouts is largely dependent on the microorganism balance on your skin. When this ecosystem of bacteria is differentiated and balanced, your skin is healthy. If the bacterial ecosystem has a low level of diversification, cutaneous sensitivity and reactivity are possible. This may even trigger pathological conditions, such as pimples or dermatitis. The microbiota on the skin stimulates your immune system and triggers the natural physiological response. It also regulates the biofilm to stop harmful agent colonization. The good bacterial ecosystem on your skin can become imbalanced as a result of several factors, such as your lifestyle, stress and anxiety. Altering the balance and diversification of the skin microbiota may result in pimples and other skin issues. The modern world is obsessed with cleanliness and this may not always be a good thing. Of course, you want to be clean and hygienic, but too much of a good thing can disrupt your skin’s healthy bacteria. For example, antibacterial soaps can negatively alter your skin’s healthy bacteria. It is important to keep clean hands, but regular soap and water is the better choice. It helps to remove visible dirt and even microscopic germs, but it also helps to reduce the impact on the healthy bacteria. Antibiotic overuse is another factor. While antibiotics certainly have their place, it is important not to use them unless absolutely necessary. Using them too often not only kills harmful bacteria, but also the good bacteria your skin needs for optimal health. Stress can also negatively impact your skin’s microbiome. Certain types of stress seem to have the biggest impact, including crowding, isolation and heat-related stress. Research has shown that stress may cause an increase in Clostridium and other potentially harmful bacteria. Taking the steps necessary to alleviate stress is important for your skin’s microbiome, as well as your general health. The next thing to consider is what you are eating. Your diet should consist of mostly natural and organic foods. Consume sufficient goods fats, complex carbohydrates, proteins and produce. It is also important to ensure that you are properly hydrated. You can also look into a supplement to ensure that you are getting enough prebiotics. Just make sure that it is high in quality and diverse so that you reap the most benefit. Stress is another trigger for an imbalanced skin microbiome. Consider what in your life is causing your stress and find a way to walk away from it. In the interim, regular exercise, meditation, spending time in nature and getting adequate sleep are ways to make stress easier to control. These two systems often rely on each other to remain healthy. Trillions of lymphocytes on the skin interact via the lymph nodes with the lymph system. Not only are these actions necessary for immune health, but also to protect the skin against the daily assaults that it fends off. Some of these assaults have the potential to influence pimples and other skin problems. The gut microbiome plays a critical role in digestion. When you are digesting foods properly, you are getting the nutrients from these foods that the body needs, including nutrients that are imperative for skin health. Just like with your skin microbiome, you want your gut microbiome to be as diverse as possible. To ensure optimal diversification, you want to do many of the same things you do for your skin microbiome, such as eating a healthy diet and reducing environmental factors that can harm the good bacteria. If you are suffering from acne, consider the health of the microbiota on your skin. Utilize the proper methods to get it in balance to enhance skin health. Consider revising your skin care regimen and use beta or alpha hydroxy acids for cleansing. Search for a microbiome balancing spray such as Neogenesis’s MB-1 spray. This spray provides prebiotic ingredients known to feed protective bacteria, but not pathogenic bacteria. Along with a healthy lifestyle, Microbiota Spray is an important means to help restore the skin’s microbiome to a normal state.